Projecting onto a surface is not a new idea. It’s been with us since the creation of the projector. In the museum context, however, exterior spaces could be used a lot more (and not simply as blatant and ill-conceived billboards). Projections can be used to great effect on building exteriors and walls to extend exhibitions, promote enquiry and create debate. One very interesting example is the ‘Gravity’ installation from France that allowed people to send real-time text messages onto the surface of a building that cascade down the exterior like tumbling fridge magnets. The best way to appreciate this work is to look at the video. 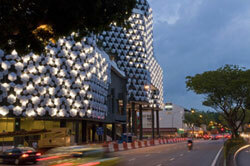 “Gravity is a collaborative application using buildings’ architecture as a projection surface. There are also hundreds of examples of ‘reactive and interactive’ buildings online – not necessarily all connected to exhibitions. It’s a new area that blends architecture, interactivity, participation, art, live performance, sound design, physics, software development, projection and so forth and we’re going to see a lot more of it. I think a lot of the current examples are interesting starts. People are trying something different – often with mixed results. Some of outcomes end up being average projections wrapped onto a building; sometimes the building surface is actually kinesthetic; and sometimes it’s a fully interactive surface (we’ll do a separate blog post on this in the near future – please me know in the comments below if you have any examples you’d like to see featured). Watch a video of Crystal Mesh. It’s an interesting aesthetic, but ultimately, once you’ve seen it, would you look out for it again and again? Maybe you would. I’m not sure that it’s something I’d go back to? Digital media should be an integrated part of your exhibition. We are moving on from the days of the ‘touchscreen in the corner’ or ‘now you’ve seen the exhibition, here it is again on a kiosk’. But it’s easier said than done. As someone who’s watched many users and visitors from all walks of life respond to digital media over the years, it’s true that as soon as people see a screen, the ‘rules of engagement’ are (predictably) point and click, stop and watch, (or more recently) the use motion or gesture to interact. But a well considered combination of media types (digital and physical) can create a more coherent and compelling experience than an exhibition that is unintentionally ‘siloed’ by media type. Think about how you can use interaction, digital resources, physical objects and projection within a space, and encourage people to interact with each other. 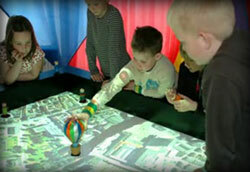 A good example is ‘I-Land, The Interactive City’ from The Children’s Interactive Library in Denmark. It’s a simple idea (the good ones often are). Children use real balloons and figurines to navigate around a table (together) to cue audiovisual responses and effects on the table itself. It’s kinesthetic, collaborative, exploratory, playful and it appeals to children. Plus, it’s relatively easy to refresh and change the content as required. A short paragraph for a short point. Simplicity, accessibility and ease-of-use need not be synonyms for ‘dumbing down’. Sometimes, museums and galleries do simple (but really effective) things like letting visitors leave a comment or picture on a post-it note (or similar) to somehow capture the collective impressions of the visitors. Why are these compelling? Why are they worthwhile? Why would a visitor bother? Because it allows you to have an uncensored opinion. It’s allowing you to participate. And you can experience something by doing (as opposed to being told from the plaque on the wall what you’re supposed to know or feel). And here’s an (anonymous) online project that is the simplest of ideas – with incredibly powerful results. PostSecrets is an ongoing community art project where people mail in their secrets anonymously on one side of a postcard. If you visit the website, you’ll find it hard not to read them all. 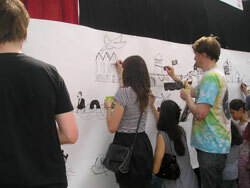 Image 4 caption: Visitors to an exhibition at the Tate Modern in England leaving their mark. Image courtesy of Geraldine Howell and Elizabeth Jones. NB: This post is an extended version of a much shorter summary article that recently appeared in Museums Aotearoa. The full post is also available on the Click Suite blog. Giles Brown is a senior writer, user experience strategist and information designer at Click Suite – one of New Zealand’s leading and most awarded interactive media companies. He is particularly interested in people, content and stories and how to best use interactive media to join them together. He’s been with Click Suite (with a few breaks for travel) since 1998. You can read further posts by him on the Click Suite blog or contact him on giles@clicksuite.co.nz.